American companies are looking for workers — lots of workers. U.S. employers posted nearly 5 million available jobs at the end of January, the Bureau of Labor Statistics said Tuesday. That’s the most since January 2001, the peak of the dot-com bubble. 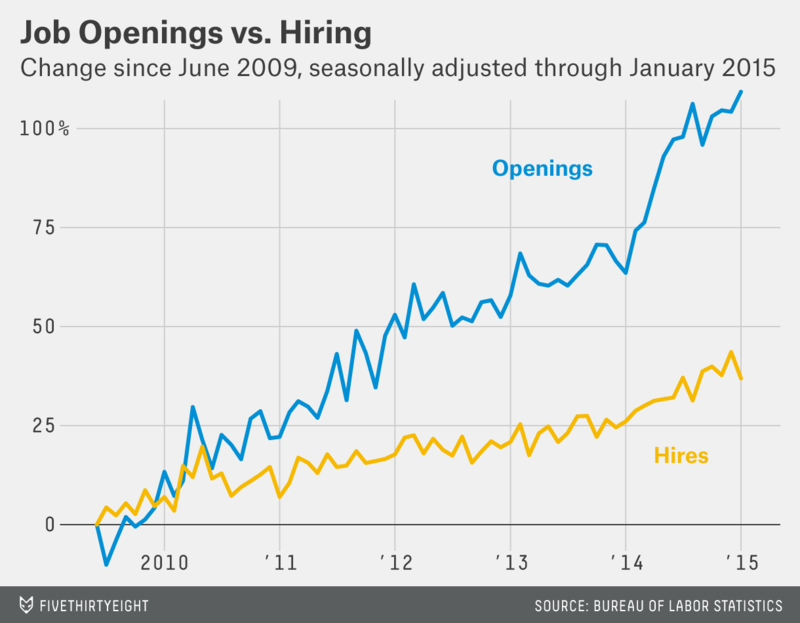 Job openings are up by 28 percent over the past year, which is good news for the unemployed. There were about 1.8 job seekers per available job in January, pretty much the same ratio as when the recession began. 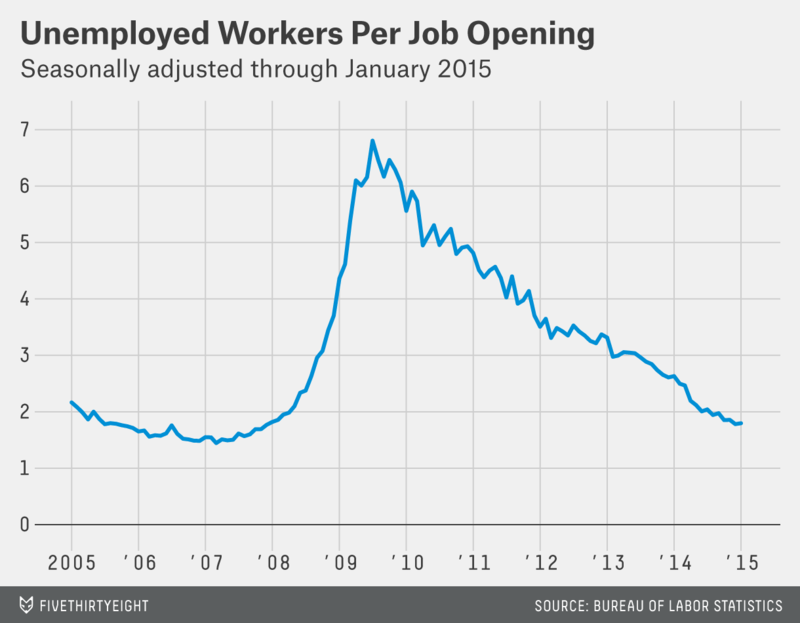 At the peak of the jobs crisis, there were nearly seven unemployed workers per job opening. It’s risky to read too much into industry-wide averages. The health care sector includes doctors but also orderlies; professional and business services includes both lawyers and temps. Still, Tuesday’s report provides little evidence that low-paying sectors are accounting for a disproportionate share of new job listings, or at least not enough to explain the slow pace of wage growth. Whitney Mancuso, an economist at the Federal Reserve Bank of Atlanta, recently reached the same conclusion using a different data source. 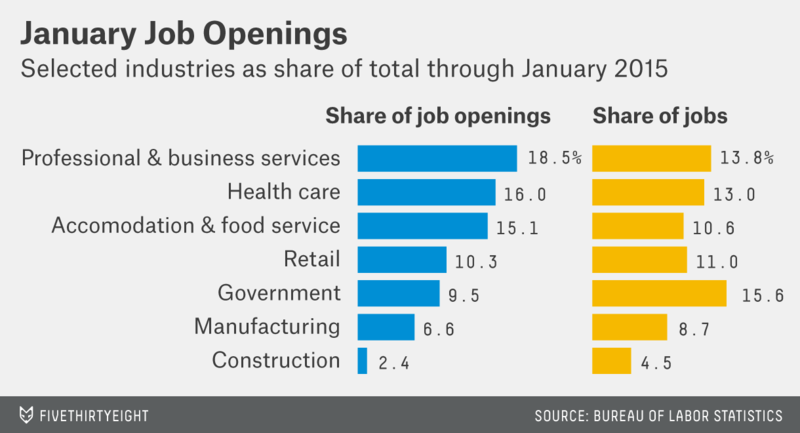 But while a wide range of companies may be posting new jobs, they remain slow to fill them. Actual hiring ticked down in January, and while the longer-run trend remains positive, hiring has consistently lagged in the recovery. Since the recession ended in June 2009, job openings have more than doubled, while hiring is up by little more than a third.